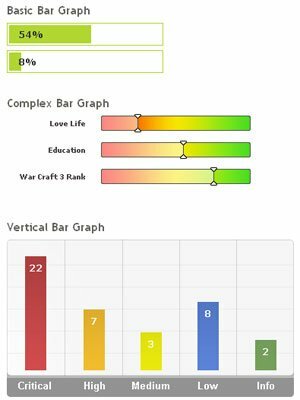 This is a simple bar graph we developed for a tool we’re releasing shortly for our client. The concept is simple, use the percentage width abilities of CSS to accurately portray a percentage bar graph. Simple progress bars in an html table to indicate the progress. This is an example of creating a semi-dynamic pie chart without the use server-side imaging libraries. Here’s an easy way to display a simple percentage graph using PHP to work out the percentages and do the maths and CSS to display the data on our page. To design the stats feature of Backbone, our Ruby on Rails CMS, we needed to show a stacked bar graph of page views vs unique visitors. 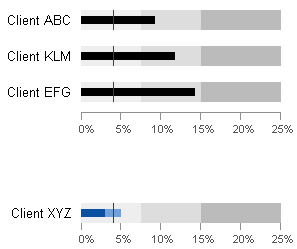 I looked around for a sample of how others did stacked bar graphs and came up empty-handed. 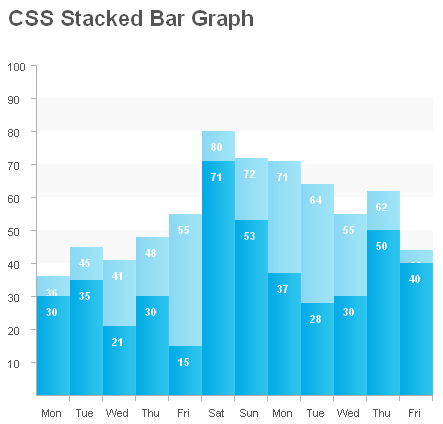 There are plenty of CSS bar graph interpretations, but none of them did stacked bar graphs. 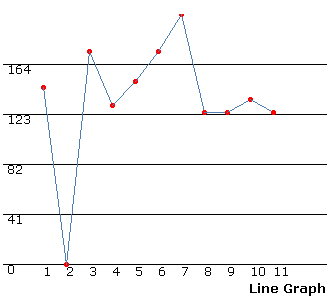 This is a purely DHTML/ CSS based Line Graph script. It loads fast and blends in with the rest of the page. You can even use a transparent background for it! Evaluate the contents of a message is important, your comments help orient the reader to another, so if the integrated evaluation system in the article content will attract many more readers. This star rating system does not have an initial state except for a zero star rating. This is not good enough. We need to be able to start with a specific rating, say 4 stars or 3 stars. Better yet would be a rating of 3.5 stars. 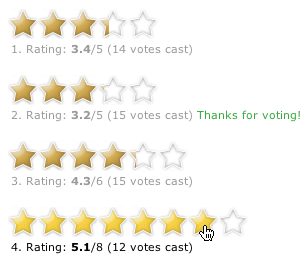 As you know, when you average a rating from many users, you will most likely not get an exact integer number. Most likely you will come up with a rating such as 3.76 stars. How do you do this with CSS? That is the question I aim to answer. Movable Type AJAX Rating Plugin Ajax Rating is a plugin for Movable Type that enables visitors to rate your entries or your blog. The “Pro” version of Ajax Rating lets you rate comments, track backs, categories, authors, tags, and just about anything else. Added features include threshold viewing for comments based on rating, listing “hot” items, and comment reporting. 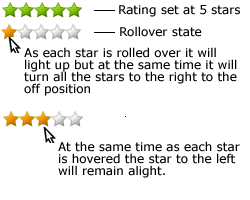 You may think a simple rollover would accomplish this but difficulty arises because as you rollover each star it should stay highlighted while you light up the next one and so on until the end of the row of stars. This article was aggregated from various sources that I have ever read, it is less than you, but please do not hesitate to bring it up right here, I will update ready to avail. Thanks for this fabulous information. This really helps, i’ve been looking for this kind of info hub on this issue for a long time now and for sure this one is great.